A good freebie is always good to have. Today, we’re happy to release a quite unique icon set. The goodie contains 92 icons in three editable variants: outlined, filled & colored, covering 15 wide categories: Science, Medical, Tech, Kitchen, Activities, Care, Weather, Marketing, Transport, Holidays, Formats, Interface, Interaction, Photo, Brands. [Links checked February/19/2017] This icon set is licensed under a Creative Commons Attribution 4.0 International License. You can use the icons in your commercial as well as your personal projects, including software, online services, templates and themes. You may modify the size, color or shape of the icons. No attribution is required, however, reselling of bundles or individual pictograms is prohibited. A good freebie is always good to have. Today, we’re happy to release a quite unique icon set. The goodie contains 92 icons in three editable variants: outlined, filled & colored, covering 15 wide categories: Science, Medical, Tech, Kitchen, Activities, Care, Weather, Marketing, Transport, Holidays, Formats, Interface, Interaction, Photo, Brands. Using a precise grid of 60px to guarantee sharpness and consistency, unlimited possibilities are unlocked when your creativity applies to this awesome set. Multiple formats available : AI, Sketch, PNG, SVG, EPS, PDF. 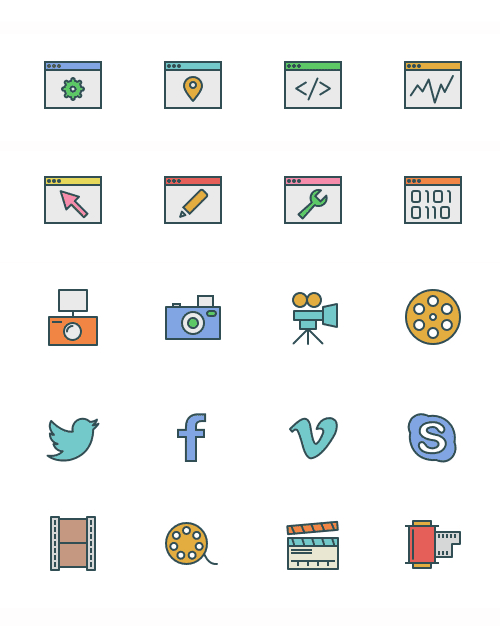 This icon set is licensed under a Creative Commons Attribution 4.0 International License. You can use the icons in your commercial as well as your personal projects, including software, online services, templates and themes. You may modify the size, color or shape of the icons. No attribution is required, however, reselling of bundles or individual pictograms is prohibited. "Building a unique icon set was not an easy task, but was a real challenge for me. I say unique because having same icons in three different styles opens the possibilities to actually use them for different states in any web or mobile application. Every icon is designed with passion but with fun too!" Thank you to Darius Dan — we sincerely appreciate your time and effort! Keep up the brilliant work!